"I'm Like a Bird" is a song written by Canadian singer-songwriter Nelly Furtado, and produced by Gerald Eaton and Brian West, as the first single from her first album, Whoa, Nelly!. It was one of the most successful singles of 2001, peaking at number one on the Canadian Singles Chart, as well as number two in Australia and New Zealand, number five in the United Kingdom, and number nine in the United States. "I'm Like a Bird" is composed common time in the key of B♭ major. The song moves at 90 beats per minute, and Furtado's voice spans around an octave and a half, from F3 to B♭4. It is written in verse-chorus form, with a bridge before the second chorus. In 2006 Furtado said of the song, "I've heard it sung at karaoke or by cover bands and it was awesome — I was like, wow, I've got one of those songs. Somebody once called it a 'hairbrush song', one that girls and guys sing in front of the mirror with their hairbrush. I just think I'm lucky I have it — it's paying the bills!" The music video for "I'm Like a Bird" was directed by Francis Lawrence. The video begins in the sky where the camera slowly pans down onto Furtado, who is lying in the grass. It then shows her singing on a tree trunk in mid-air. In the chorus she gets up and starts singing to the camera while birds are flying around her. The second verse shows her sitting in mid-air in a forest, while singing to the camera. The chorus consists of flashes of Furtado singing in mid-air, again, while leaning on the tree trunk. During the bridge she is singing to a bug while her eyes change colour. The conclusion of the video shows her falling backwards from a branch into a crowd as she sings the final chorus of the song. The last shot pans out to reveal a crowd of tens of thousands. There was made an edited version of the music video for European VH1, where some scenes where changed. Credits are adapted from the Whoa, Nelly! album liner notes. 1 2 3 Sheet music for "I'm Like a Bird". Nelstar Publishing. 2001. ↑ de Silverio, Victoria. "Nelly Furtado: Free As A Bird". Blender. July 2006. Retrieved 18 September 2006. 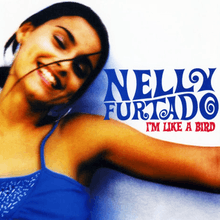 ↑ Method Studios - Nelly Furtado "I'm Like a Bird"
↑ (2000) Album notes for Whoa, Nelly! by Nelly Furtado [liner notes]. DreamWorks Records. ↑ "International Chart Performance". Swisscharts. Retrieved 2008-03-26. ↑ "Australian-charts.com – Nelly Furtado – I'm Like A Bird". ARIA Top 50 Singles. ↑ "Austriancharts.at – Nelly Furtado – I'm Like A Bird" (in German). Ö3 Austria Top 40. ↑ "Ultratop.be – Nelly Furtado – I'm Like A Bird" (in Dutch). Ultratop 50. ↑ "Ultratop.be – Nelly Furtado – I'm Like A Bird" (in French). Ultratop 50. ↑ "Nelly Furtado – Chart history" Canadian Hot 100 for Nelly Furtado. ↑ "Danishcharts.com – Nelly Furtado – I'm Like A Bird". Tracklisten. ↑ "Lescharts.com – Nelly Furtado – I'm Like A Bird" (in French). Les classement single. ↑ "Musicline.de – Furtado,Nelly Single-Chartverfolgung" (in German). Media Control Charts. PhonoNet GmbH. ↑ "Chart Track: Week 15x, 2001". Irish Singles Chart. 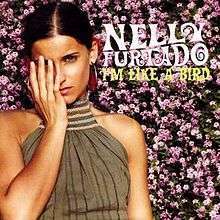 ↑ "Italiancharts.com – Nelly Furtado – I'm Like A Bird". Top Digital Download. ↑ "Dutchcharts.nl – Nelly Furtado – I'm Like A Bird" (in Dutch). Single Top 100. ↑ "Charts.org.nz – Nelly Furtado – I'm Like A Bird". Top 40 Singles. ↑ "Norwegiancharts.com – Nelly Furtado – I'm Like A Bird". VG-lista. ↑ "Top40-charts.com". Retrieved November 24, 2015. ↑ "Swedishcharts.com – Nelly Furtado – I'm Like A Bird". Singles Top 100. ↑ "Swisscharts.com – Nelly Furtado – I'm Like A Bird". Swiss Singles Chart. ↑ "Nelly Furtado: Artist Chart History" Official Charts Company. ↑ "Nelly Furtado – Chart history" Billboard Hot 100 for Nelly Furtado. ↑ "Nelly Furtado – Chart history" Billboard Pop Songs for Nelly Furtado. ↑ "Nelly Furtado – Chart history" Billboard Adult Pop Songs for Nelly Furtado. ↑ "Nelly Furtado – Chart history" Billboard Adult Contemporary for Nelly Furtado. ↑ "ARIA Charts – Accreditations – 2001 Singles". Australian Recording Industry Association. Retrieved July 9, 2015.